Do you ever struggle with what to post on your company’s Facebook or Twitter page? It can be difficult to get inspiration, keep things fresh or find a good rhythm. For my day spa client Spaah, I recently ran a photo contest on Facebook that crowdsourced material for future Facebook posts. Strategy. Something I regularly post on Spaah’s Facebook page are “Monday Moments of Zen.” It’s a weekly photo of a sunset, mountains, forest, hammock – anything nice and relaxing to look at, which ties in with the day spa’s offerings. Digging for photos online got a bit time-consuming, and since I’d had good results before with Facebook contests for Spaah, I decided to run a photo contest among its fans. Launch. Starting the contest was pretty simple. I came up with contest rules that were easy to convey, collaborated with the owner to determine the prize amount of $50, and created a Google Drive document with the required legalese for Facebook (see more details in a past post). 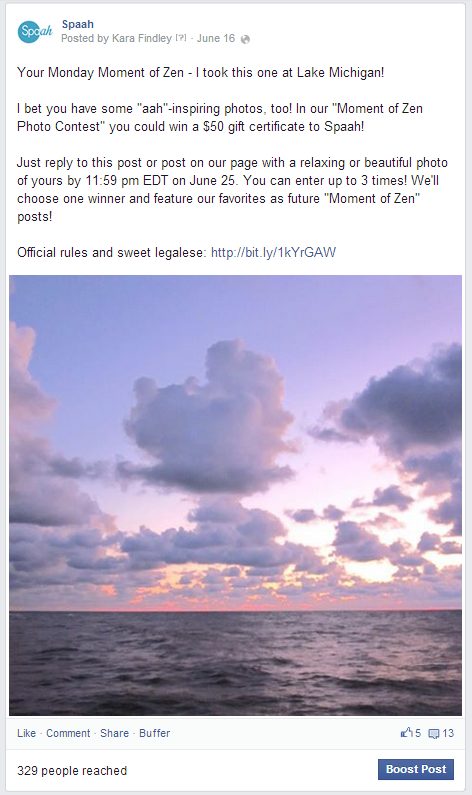 On June 16, 2014, I announced the contest via a Monday Moment Facebook post. I included the rules, link to the legalese, and experimented with a relatively short deadline of nine days. Promotion. My goal was to promote the contest as organically as possible, so I posted reminders about it every couple days – not too often to be annoying. The five organic contest-related posts reached 276 fans on average, when Spaah’s fan base was 1,613 and typical non-contest posts reached about 150. On the last day of the contest, I boosted a reminder post for $5, resulting in reaching 1,044 people. Results. The contest created a surge in Spaah’s reach and a modest gain in the number of fans. But more importantly, 71 unique photos were submitted, 28 of which would be usable for future Monday Moment of Zen posts. And since the total cost of the contest for Spaah was $55, that’s only $1.96 per piece of content. Since they come from the community, the fan-submitted photos are much more engaging than photos I just find online. Though brand pages cannot tag individuals, I give full credit to each participant (as specified in the contest details), which results in some fun interaction as well as more engagement and reach. Furthermore, the time saved allows me to focus on more strategic marketing plans for Spaah. 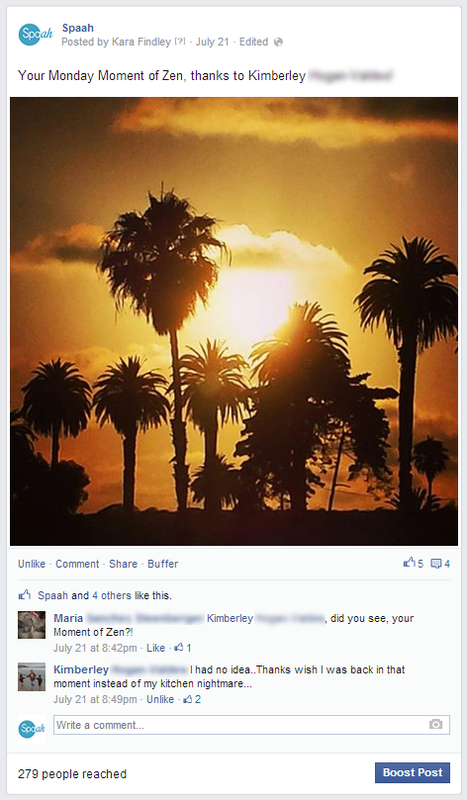 Need help with running a Facebook contest for your organization? Check out our 5-part Facebook Playbook series, or contact us for our expertise! ← The Latest Email Trend – Will It Last?